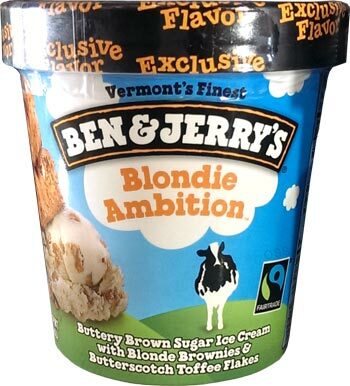 [New for 2013, Exclusive to Target, renamed/GMO-free in 2015] Well, well, well, it seems a lunch time chore run has paid off in the form of spotting Target's other new exclusive 2013 Ben & Jerry's flavor. The first flavor my area saw, Peanut Butter Jam Session, is a winner, so let's see how this one compares. As you can see, there aren't a lot of mix-ins exposed just yet, so let's taste just the base. Yeah, bummer, it's really mild. I know I may not be as tuned in as some of you are, and I don't always pick up delicate notes of this and that, but for me, this is super mild. It tastes neither buttery nor brown sugary. Oh, it's a fine texture, and there's a little something going on flavor wise, but it's just a hint. It kind of reminds me of that delicate straticella flavor from Talenti in terms of subtlety. Keep in mind that it's not like this pint isn't fresh and the flavor has faded. I'm enjoying the brownies. I can't describe their exact flavor because they actually remind me of a breakfast cereal, but I can't think of which one. They're neat and by the time I was done my first serving, I realized this whole pint is about showcasing these brownies. They are fairly dense, fairly chewy, and a bit smaller than there 1" square chocolate cousins. Occasionally you get a big hunk of the butterscotch, which is a good thing because the tiny bits aren't doing a whole lot for me. Ofcourse, even this big chunk provided just a mild hit of butterscotch. It's surprisingly tame. 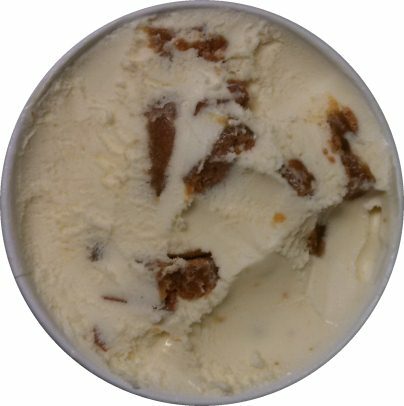 I think the problem for me is that this one is playing it safe while my tastebuds are flashing back to Hannah Teeter's Maple Blondie. That was such a sweet flavor and I guess I don't understand why they dialed this one so far back. This one sounds amazing with the potential of being the breakthrough flavor of the year. I am shocked it was disappointing. 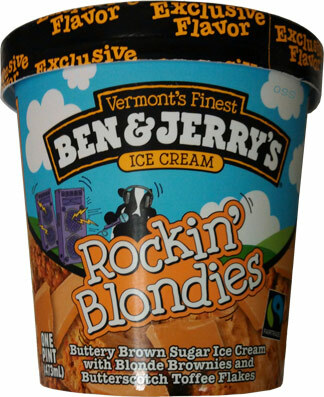 I'll be on the look out for this pint although I doubt I will find it because our Target never carried Peanut Butter World. 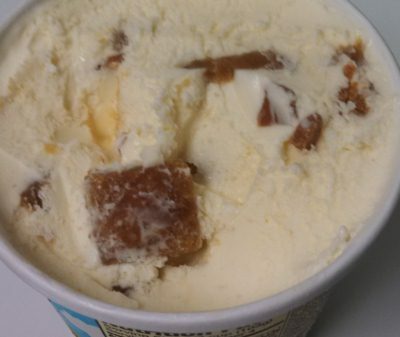 My pint had virtually NO brownies and tons of butterscotch slivers. Too boring for words, didn't even finish pint. I would have felt cheated with not receiving any brownies! Sadly, I would have still finished the pint. I'm kind of greedy like that. "A lot" is two words, honeybunch. Bland, bland, bland. 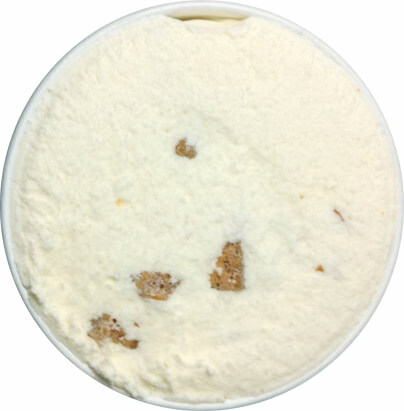 The ice cream itself is just a less sweet vanilla. The brownies taste like crunchy, unflavored dough, and the highlights (the butterscotch toffee pieces) are too small and too scarce. I definitely wont be trying this again. Bought this at Target last week and was disappointed. In my opinion, blonde brownies should have a nice, brown sugary flavor, but I didn't like the flavor of these blondie pieces at all. 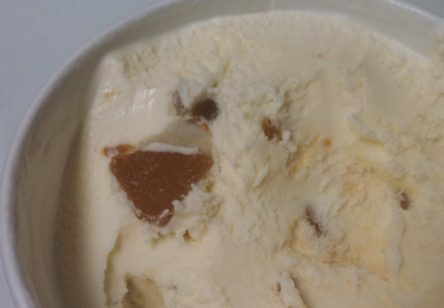 The ice cream and butter brickle bits were OK. Thanks for providing this place to share comments!